Posted November 21st, 2014 at 10:10 am | Log in to reply. This recipe got really great reviews from my guests who grew up in Korea. The husband could not believe that it was possible to learn how to make this purely from Youtube and not from one’s own mother or grandmother. Well, Maangchi is standing in for a Korean mother for many of us, I think! Posted November 23rd, 2014 at 10:22 am | Log in to reply. I’m happy to hear that everyone liked your dongchimi! Yes, it’s possible to make delicious Korean food from my recipes, because I’ve been working on these recipes for decades! Posted September 3rd, 2014 at 9:39 am | Log in to reply. I followed your recipe, and was rewarded with the sweet sweet taste I remember from my youth. It is amazing how a smell or taste can take you back so many years, for me about 45 years, since I was able to enjoy that sweet briny taste. I have posted before, and once again Thank You for what you do. My mother passed away when I was young and I lost those wonderful smells, and tastes when she went. Today and through your recipes I can re-live those lost memories and enjoy such a re-birth of my heritage thru the delicious Korean cuisine. P.S. Some day I’ll have to come to NYC to meet you, it would be a pleasure. Posted September 3rd, 2014 at 11:33 am | Log in to reply. Thank you for sharing your touching story about your mom! Even though your mom passed away when you were very young, you still remember the taste and the smell of her food! Posted June 9th, 2014 at 6:41 pm | Log in to reply. Manngchi, after the 2 days at room temp I tested it. The brine is delicious but the radish were not fermeted, it has been about 70 degrees in the house. The radish was about the same size as in the video. 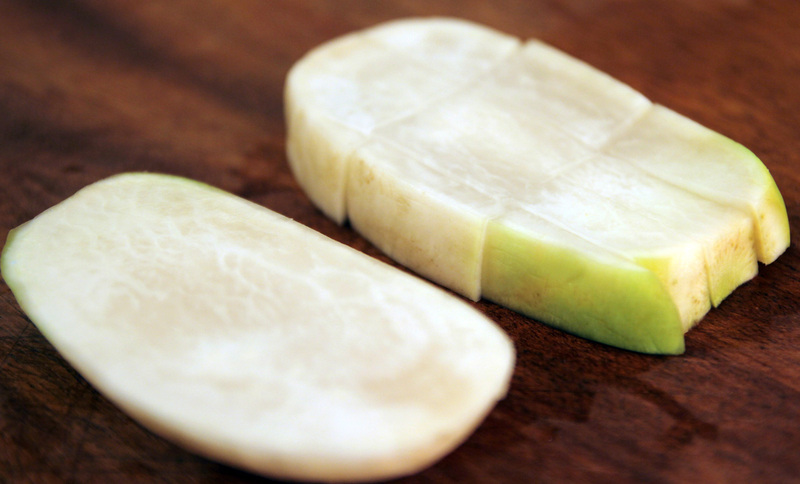 Anyways, so I cut the radish in half length wise and out it back so it can ferment a little more. What do you think? Thank you. Posted June 11th, 2014 at 11:19 am | Log in to reply. Posted February 4th, 2014 at 6:17 pm | Log in to reply. This may seem like a simple question, but I don’t have cheese cloth! anything I can use instead? I have a metal strainer ball I use for soup, is that ok? Posted February 6th, 2014 at 8:28 am | Log in to reply. Cotton cloth will work well. I wouldn’t recommend metal strainer ball. Posted June 14th, 2013 at 2:22 pm | Log in to reply. Hey Maangchi! A friend of mine wants to make these and he wonders if it’s OK to use a plastic container instead of a glass one. Basically we buy dong chi mi at the local Korean store and it comes in a plastic jar, so he was thinking of just using that. Does this sound OK or is glass preferable? Thanks! Posted June 15th, 2013 at 9:35 am | Log in to reply. yes, I sometimes use my plastic container, too. Posted May 30th, 2013 at 7:39 pm | Log in to reply. Hi Maangchi, I’ve been watching a lot of Korean cooking shows lately. This looks like the White Kimichi they make. Is it the same? I’ve been really wanting to try it. Sorry don’t have much experience with Korean cooking. Just what you’ve taught me. Thank you for your responses on my other posts. Posted May 31st, 2013 at 6:17 am | Log in to reply. Posted May 5th, 2013 at 12:29 pm | Log in to reply. Hi Maangchi! My question is, after its finished, about how long is good for? My question goes for most kimchi as well. I know some kimchi tastes better after its fermented a lil longer, but is there ever a point where its actually “gone bad”? Posted May 6th, 2013 at 8:34 am | Log in to reply. 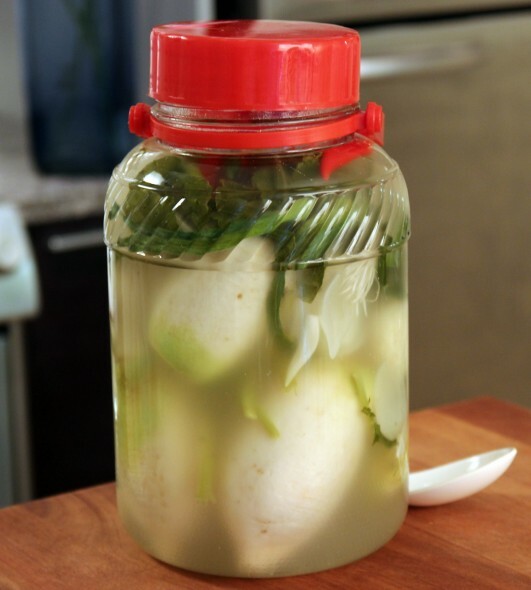 Dongchimi should be eaten asap after it ferments because the broth and the texture of radish will change. But other types of kimchi can be last for a long time if you keep it in the fridge. We have already talked about this topic on the forum. Check these out please. Happy cooking! Posted March 4th, 2013 at 6:18 am | Log in to reply. Hello! 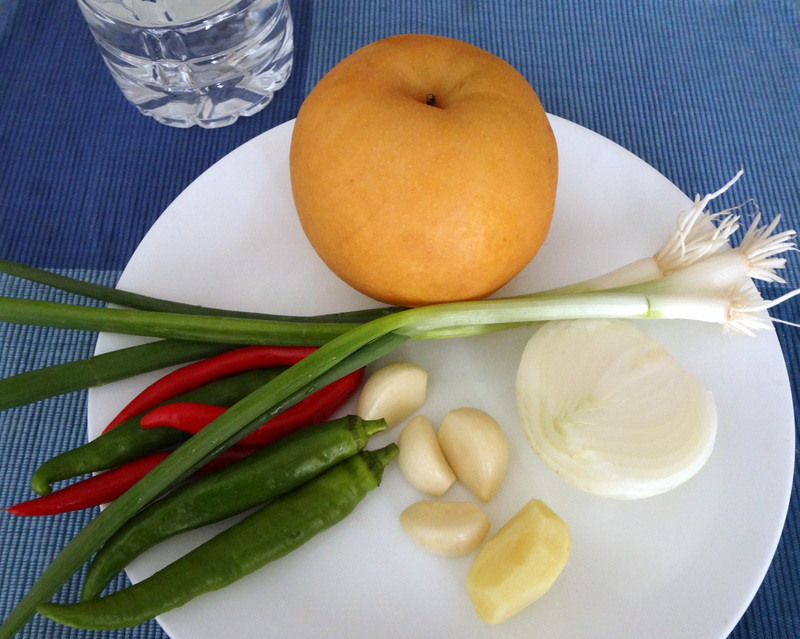 I was just wondering if I could change the pear to an apple? yes, some people use an apple. Good luck! Posted February 6th, 2013 at 6:54 am | Log in to reply. Hi maangchi! Im about to try to make dongchimi and im real excited about it. 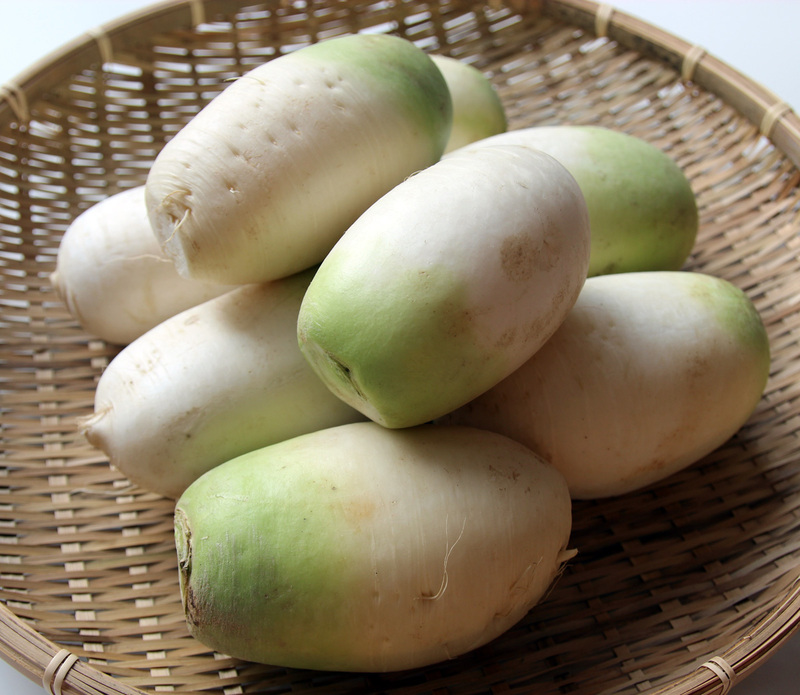 However when i went to the grocery store, daikon radish is not available- only the long radishes are available. Can i use them for your recipe? If yes, do they taste the same? Thanks! Posted February 6th, 2013 at 11:28 am | Log in to reply. yes, any type of firm radishes will work well with this recipe. Good luck! Posted February 10th, 2013 at 1:38 am | Log in to reply. Posted August 10th, 2012 at 8:38 pm | Log in to reply. The mu in my local korean mart were HUGE! I had to double-check they weren’t daikon, but they were the korean radishes, just the size of my arm up to the elbow!! Would it still be the same process if I just cut them down to pieces about the size of my fist? (small hands!) 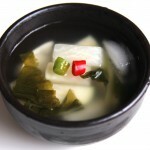 I bought some dongchimi already made so I can make guksu for my boyfriend and I, but I am looking forward to fermenting my first delicious thing =) I haven’t tried kimchi yet, I’m afraid our roommate might get cranky -.- He will have to just deal with it soon though, because I want to make my own for jjigae! Posted August 11th, 2012 at 11:13 am | Log in to reply. Posted August 1st, 2012 at 2:34 pm | Log in to reply. 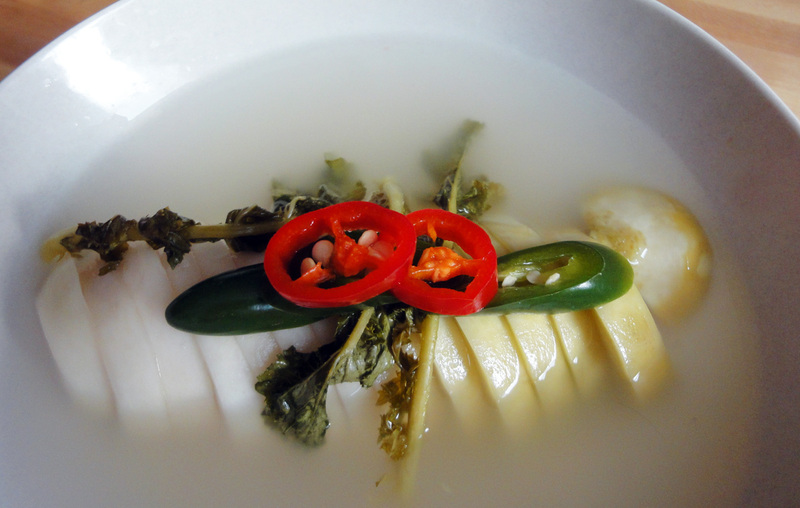 As I use the broth to make cold water kimchi soup, the radishes are no longer covered and I’m worried they may spoil. 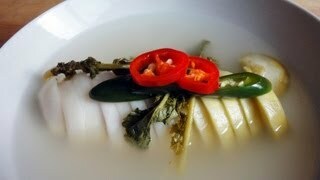 Once I’ve used some of the broth, can I add more water to the water kimchi? Posted August 2nd, 2012 at 9:10 am | Log in to reply. “can I add more water to the water kimchi?” I wouldn’t do that. The best thing is to eat the radishes quickly. Posted June 11th, 2012 at 4:27 pm | Log in to reply. Hi Maangchi! I tried this twice but the brine became thick and slimy after 2 days. I’m scared to eat it. Is it correct? (I used boiled and chilled water) Also, just out of curiosity, do you know why the brine turns milky colored? I really want this recipe to work because when I ate some after just one day of fermenting, it tasted so good! Posted June 13th, 2012 at 10:08 am | Log in to reply. Posted June 11th, 2012 at 4:18 am | Log in to reply. So i made my very first dong chi mi. Kim chi goong mool tastes great. The problem is the radish. Radish itself is not fermented at all. What should i do? What should i do? Posted June 13th, 2012 at 10:09 am | Log in to reply. oh the radish must be too large, Cut it into smaller chunks and put them back to the jar. Posted June 6th, 2012 at 8:21 am | Log in to reply. hi maangchi. when dongchimi is done, is it okay to store it outside the ref.? room temperature is about 20 degree celcius.. or should i keep in in the fridge? Posted June 7th, 2012 at 9:40 am | Log in to reply. 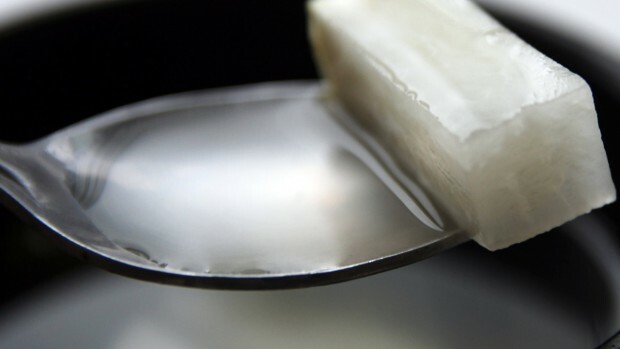 Yes, after your dongchimi is fermented well, keep it in your refrigerator. Posted November 14th, 2012 at 11:44 am | Log in to reply. How long does it last? I made some towards the end of July, and it still seems good. Broth isn’t slimy, radish is sweet/tangy/spicy/garlicy and still crunchy. Still OK? Posted June 4th, 2012 at 10:32 am | Log in to reply. The video was watched 283,370 times on YouTube & has 2,634 likes!